The world’s favorite little roadster – Mazda’s renowned MX-5 – was lucky enough to get a model kit release from Tamiya in its latest generation (where’s my 2015 WRX STi, Tamiya?). 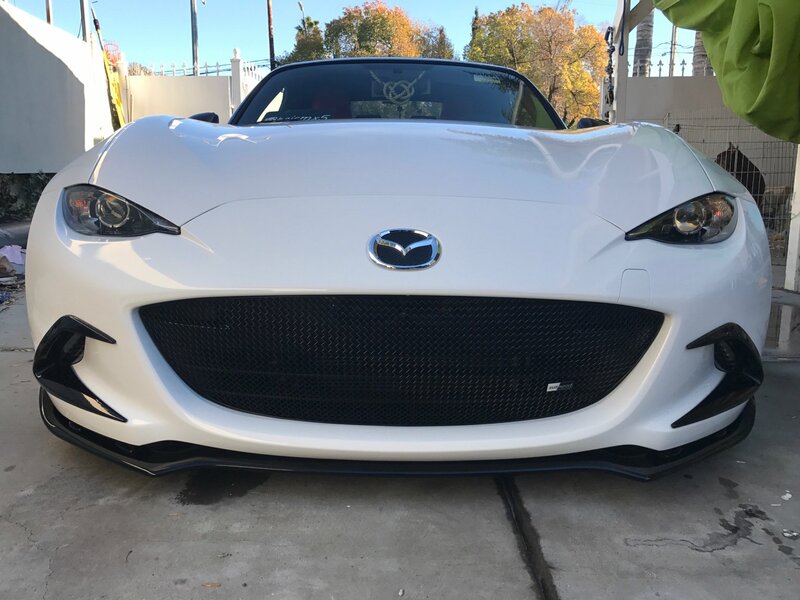 Starting life in model year 2016, the latest in the Miata lineage retains the usual goofy grin and naturally aspirated four banger motor. I love these new box arts for Tamiya’s modern releases. Interestingly enough, the word “Miata” isn’t actually mentioned anywhere up front. Some nice profile and front/rear views on the box, but no actual model kit shots – these are all renders of the actual car, as far as I can tell. Weirdly enough it looks like Tamiya went the extra mile and decided that your Miata wouldn’t be complete without someone in the front seat. Will be interesting to see how they manage that. Something something one true sports car something something take me in the corners bro. Oh. So we get a driver figure in a sort of soft PVC plastic plastic, very much akin to the pilot figures found in older 1/100 Gunpla from the Wing and Seed era. It looks to just be a generic woman, meant to go in the driver’s seat with hands on the wheel. Two versions of the main body are included, for left and right hand drive. As unique as this feature is though, I think I’m going to omit it from the kit entirely – just feels weird to give this car a driver in the seat when none of my other cars have one. For one of Tamiya’s more expensive kits ($40~), there’s not too much in the way of actual parts count or complexity. There’s a fair amount of detail for the suspension components and interior, but sadly no engine. Normally I wouldn’t mind, but at this price I’d expect that level of detail; for a $20 kit I wouldn’t miss it. It’s kind of weird building my first roadster and not getting a full clear plastic dome in the clear parts runner – all we get is the front windshield here. I had already picked out the wheels I wanted to use on this car before I bought the kit – since they’re conveniently just the leftover “stock” wheels of my Rocketbunny FR-S. They looked way too small for that car after its widebody conversion, but I figured then they’d be just right for something like the Miata. Turns out the stock wheels on this thing are even smaller, though the giant stock tires sort of make up the difference. This is why I’m really enjoying these car kits – there’s maybe 30 or 40 parts total for most of these, making for a quick process to cut everything out and clean it all up. A lot of the nuances come with the painting and final assembly. There are like four ways you can build this car, with the A B C D designations standing for each regional version. I believe A is the JDM version, of which for some reason it’s the only version to have part of the underside skid plate removed. Praise be left-hand drive options. Driver assembly, with a complete painting guide on how she should look. Too bad no eye decals or anything were included; if I even did attempt to paint her I’d probably leave her eyes blank and lifeless. The weirdest thing was that the manual called for seatbelts over the driver figure, but I didn’t see any rubber parts or anything that I thought the belts would be made out of. I then discovered that they actually gave it to you as basically black masking stickers. I won’t be using them this time so I can’t really speak to how they look, but maybe in the future for another car I’ll try them out. Getting to the tiny roadster body. Apparently the North American Miatas have these secondary shark fin antenna attachments on their trunk lids. This is especially weird because there’s already the standard radio antenna opposite the gas cap, so I almost thought I was making a mistake by putting it on. A little research later and it turns out the shark fin is apparently exclusively for models equipped with satellite radio. Requires a little pin-hole to be drilled in order the mount the part; I was confused at first because there was no indication of how far along the trunk lid I was supposed to mount it, so I just drilled one at random and hoped it would look good. Later on I realized that Tamiya included a little indent on the underside to guide your drill point, and I was only a millimeter off. A simple dash to be sure, but a welcome one. I just noticed while building the tub that there’s only one option for the center console, despite different dashboards being given depending on right hand drive or left hand drive configurations. This means that the parking brake will always be on the right side of the center console. I test drove an ND Miata and distinctly remember thinking that it was a strange quirk to have the e-brake on the side away from the driver – I suppose it makes sense now that it’s that way because on the JDM RHD car it’s actually on the driver’s side. The USDM and left-hand drive versions were just an afterthought so we didn’t even get a remodeled center console. The roadster-ness gets weirder when there’s no roof to tape to my Starbucks bottle to get it up for paint. The thin upper windshield frame will have to do. This is one of the few times I’ll actually build a car very close to the boxart. I usually like to mix up the colors and make them all wild and unique, but in this case I think the dark metallic red works really well for the modern Miata, so I’m sticking to it and keeping it as a clean near-stock build. The box even mentions which specific spray paint to use to achieve the Miata’s stock red, which happened to be Pure Metallic Red. Sure enough, I picked up a can and it looks pretty good. Suspension and undercarriage painted, ready for smaller details to be added by hand and then assembly. So quite interestingly, the manual called for the exhaust to be painted gold, which puzzled me a bit. I’ve never seen a brilliant gold exhaust before, let alone from factory. After a bit of online searching for the ND’s undercarriage, it turns out the manual meant that it was supposed to be silver with a tint of gold, as apparently exhausts oxidize in this way or somesuch. My approach to get this effect was to paint the entire thing solid gold first, then mist a thin coat of silver over it, so it ended up looking mostly metal with hints of gold showing through. It actually ended up looking really nice; I dig the effect, realistic or not. In person the gold tints are actually really subtle; you barely notice it unless it’s against something that’s actually fully silver, like some of the suspension components. Speaking of which, the front and rear suspension assemblies are now together. Some parts of the undercarriage were apparently supposed to be gray, rather than all black. Since I already went the extra mile with the gold-tinted exhaust, I figured I might as well add these details too. The dash is nicely detailed, and includes a good amount of chrome parts, though once those areas like the vents are properly painted away, there won’t be much chrome actually remaining. A masking sticker was included for the windshield, which ended up working perfectly. Rarely does it ever come out this clean, even with the masking stickers included from the kit. Masking for the windshield frame and trim that goes around the tub. Tamiya gloss black is a godsend. This stuff always comes out with a mirror-sheen even without sanding or polish. While the windshield frame turned out great, the little weather strip trim around the tub didn’t turn out quite as clean. We got a bit of paint spill that got under the masking tape, and it’ll be tough to take that out with thinner without taking off the red paint underneath. So I figured I would test out a new solution – apparently to get a better shine and finish out of my cars, super high grit sandpaper should be used to rub down the body, followed by some heavy polish to bring out a mirror gloss. In this case I’ll be testing it out first by attempting to sand down the black paint overspill. The grit is extremely fine, so it barely even manages to take off the black paint, let alone eat into the red. Hoping some polish after this will make it all shiny again. Testing the aftermarket wheel fitment with the suspension and chassis in. Cutting the inside hubs on the wheels to reduce the offset will definitely be needed – otherwise they’re never fitting under the fenders. The base paint shine isn’t bad – I could honestly probably live with this. There’s slight orange peel after two coats of Pure Metallic Red and two coats of Clear Gloss. The metallic base paint actually hides the orange peel better than most solid colors. But we’ll see if we can’t get something better. The entire body is scuffed up with the 3000 grit sandpaper, which will then be polished with Novus plastic polish to (hopefully) achieve a discernible shine. The ND has a surprising amount of chrome and clear parts for all of its lights and reflectors. Little paint work is needed here, other than some black fill-in for the headlights. Gotta hand it to Tamiya for including every single variation of rear reflector, since apparently every market had different setups. I’m super grateful for the little tabs on the clear and chrome pieces that slot nicely into the body. This makes assembling the head and taillights a million times easier, since I no longer have to bead a thin line of cement around the clear lenses and hope it takes to the body without getting the cement everywhere. Metal transfer decals given for the mirrors and badges. Like the NSX, these mirrors are extremely realistic with how thin and recessed they are, owing to their nature as decals rather than thick chrome plastic as older kits tended to favor. Went in with gloss black acrylic brush paint to finish up the rear diffuser and side skirts. I’ve more or less gotten the technique down for removing these wheel hub mounts now, since I will forever insist on putting on wheels that aren’t meant for the car (or even the model brand, since these are Aoshima wheels I’m forcing onto a Tamiya kit). Take an exacto knife into the hub mount, slice it into quarters, and use pliers to pull and break the pieces off. The end result isn’t the cleanest, but the most important goal of removing these is to clear up room so the wheels will fit under the fenders; to this end the method gets it done. I hate modifying suspension components to lower cars or make wheels fit when even cutting the inside hub isn’t enough. In this case we’re just lowering it a bit so the wheels will be flush, but there’s still a lot of delicate things to cut and adjust. After cutting the struts, it was thankfully fairly easy to just use pliers and bend the control arms into place. The right side shown above is the adjusted and lowered suspension; the left is stock. I didn’t think I was lowering it by much, but looking at it like this there’s actually quite a significant difference. Lowering done and wheels mounted; with this we just need to finish up the body shell and it should be good to go. As a sort of last-minute mod, I decided that I didn’t want to roll with the stock grille insert. I was building this kit nearly to boxart specs, so I wanted to change it up a little more just for the sake of customizing. Some leftover grille mesh from other kits would be a good replacement for the stock insert. Glued in, with a little masking tape help. Unfortunately I didn’t stop to consider if it would look strange with a big front grille opening covered only by mesh when there was no engine detail or even radiator detail to be seen through said mesh. Tamiya only gives a little blank rectangle up front that’s meant to be a blanking plate for the original bumper insert, so it doesn’t even fill in the entire front grille. I went through with my mesh anyway; it didn’t bother me that much that you could see a little black rectangle through the front. I lied. After the kit had been finished for a while, I was reviewing the initial photoshoot and decided that I couldn’t live with the ugly blank black plate behind the bumper grille after all. So to fix that we would need a spare radiator to shove back there, but from where? Luckily I had a completely spare 300zx lying around because I screwed up with that kit before. I feel (kind of) bad cannibalizing an otherwise complete kit just for a radiator, but it was cheap and I don’t plan to build this thing anytime soon anyway. Today I learned Z radiators are ginormous compared to what a Miata’s supposed to be. How did I ever fit this thing in the 300zx? The stock black blanking plate was cut out, the Z’s radiator was trimmed, painted silver, and stuck on. I then test fit the body over this to see how the grille would look, and even with an actual silver detail piece it still looked too in-your-face. The solution: add another piece of grille mesh over the radiator itself, and then the body with the grille in the opening over that. This would make it a nearly double-layered grille, but it works well in keeping the radiator as a more subtle detail. Upon final body fitment I found that I had skewed the lowering quite a bit – the front still had a fairly significant gap, while the rear was hella slammed flush stancenation bro. Naturally I went back and tweaked it more until it looked even. Once it was all said and done I went ahead and compared the stock ND wheels to my aftermarket Rays – and they don’t even look that far off from each other. The tire profiles are more different than the design of the wheels themselves. There’s our happy little roadster. If I ever got an ND I’d probably build it like this – the clean look is nicely understated, with the concave wheels and stretched tires working as enough of a modified touch. I’m happy with how the ride height turned out too – it took quite a bit of back-and forth to get all four wheels balanced, but now it looks cleanly lowered without going too crazy slammed. Original blank plate juxtaposed with the revised radiator. The lack of motor clearly evident in the first image is super jarring. Admittedly, the double layering of the mesh means the fine detail in the new radiator is all but lost, but I prefer it to be a little more indistinct this way, since actual Miatas that sport this grille somehow don’t have anything showing through. I’m rather glad I got to keep the front wheels movable; I often get too greedy with aftermarket wheel fitments and end up losing any turning capability whatsoever. Thankfully I didn’t commit such sacrilege on a car that’s renowned for being able to turn well. The scuffing with the 3000 grit sandpaper also worked fairly well – I didn’t notice a night and day difference in the gloss finish (probably because I only sanded and polished the clear coat, leaving any orange peel from the color coat beneath untouched) but it’s certainly one of the cleanest and glossiest finishes I’ve ever gotten. One particular thing to note that’s of minor annoyance is that the long thin radio antenna has a penchant for snapping off (whodathunkit). It’s not a big deal because I can just re-glue it every time, but it makes handling this model a bit more precarious. I really, really like how the interior turned out. It comes from a combination of the ND’s tub just looking sleek and modern, and also that there’s no roof or enclosure so all the fine details are on full display. At one point I seriously considered replacing the stock seats with racing buckets, but then decided that the stockies are actually pretty nice as far as factory seats go, so they deserved to be kept. I’m partial to the subtle design language of having inside door panels as the same color as the car’s exterior body, since I think it adds some nice variation to an otherwise all-black interior. As far as I know only the ND Miata and new Volkswagon Beetle do this, though I’m sure it’s much more widespread in cars that I’m not as familiar with. One of the nicer undercarriages I’ve built, since I usually don’t go out of my way to try very hard down here. And of course, no top of any kind is given with this kit. The soft top compartment behind the seats is just a plastic cover, with no optional open version included, or even the option of closed door windows. I later learned that a resin RF top conversion kit is also available for this model, so you could technically get the targa top option there, but with so few convertibles in the collection I’m pretty okay with keeping the cabin open. Side by side with the car it’s most often compared to in modern day – Toyota’s own lightweight, RWD, lightly-powered coupe. The build philosophies between the two are clearly very different. The Miata also has the clear advantage of still being able to turn its front wheels. I’m really satisfied with how cleanly this build came out – ironically it was just as a result of building the kit with minimal extras, rather than doing a whole bunch of crazy things that would’ve ended up making the car messier rather than cooler. There’s a Rocket Bunny resin widebody add-on set available too and sometimes I wonder if it would’ve been cooler to go full racecar, but I think there’s a charm to these lightly modified builds.